A SOCIETY which has been working to protect Harborough’s heritage for more than 50 years has come out strongly against council proposals to move the market. 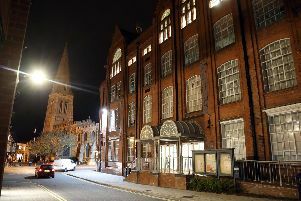 Its objections are listed in a strongly worded letter sent to Harborough District Council’s chief executive Anna Graves. *Slams the proposed closure of the Market Hall as a venue for traders and calls instead for its revitalisation. *Describes the suggested new venue for stallholders at Fox Yard as a ‘dismal back yard’ which would put an end to the market in Harborough. *Strongly criticises plans to put the library on the first floor of Harborough Council’s Adam and Eve Street HQ, which he says will put off disabled users and people with pushchairs. *Condemns suggestions to pedestrianise Adam and Eve Street, raising traffic concerns and questioning how deliveries would be made to shops. *Questions the need for more shops and calls on the council to protect independent traders instead of attempting to attract a big brand to the Market Hall building. Its headquarters has twice the floor space required and the council says the building is no longer fit-for-purpose and needs extensive renovation. The launch of a property review last year saw the appointment of Willmot Dixon, which has proposed the council find a big-name retailer for the Market Hall, with the income from that funding a regeneration of the headquarters, to include shops and cafes and accommodating the market traders in Fox Yard. The council says the proposal would keep its offices in town as well as generating more income by renting out the surplus space, helping balance its budget. A final decision has not been made, but the council has commissioned a full business case to look further into the proposals, with the results going to full council on April 30. The review is part of a wider Transformation Programme at the council which has set out to save between £3m and £5.7m over the next five years. The Civic Society’s letter, which has been submitted as part of the council’s consultation in to the proposals, states: “The council proposes to close the indoor market without adequately providing replacement facilities. “Both the traders and customers are used to a covered market hall for twenty years and to push it outside will not meet the needs of traders or customers. “If the plan to utilise the Market Hall by another large retailer were to go ahead this would be detrimental to the town. “One of the attractions of Harborough is the number of independent retailers. They should be encouraged in preference to large national chains. Meanwhile, the council’s chief executive met with traders on Friday, February 24, as part of an ongoing consultation into the proposals. Traders have argued strongly against the proposals, putting together a petition now signed by more than 14,000 people and organising a protest march, due to take place on Saturday, March 17. He said traders had instead suggested improvements to the hall which they believe would increase its revenue for the council, including installing fixed shop units at thge edges of the hall, removing plinths in the centre so it could be used as a venue for exhibitions and opening six days a week. “I think it would be the best way forward - for the council, for us and for the people of Harborough, who want the market to stay where it is,” he said. Mrs Graves said: “We were pleased with the turnout and grateful to the traders for coming along to share ideas and thoughts with us around what is clearly a challenging issue.